Age 8, I was set an assignment at school to write to someone who inspired me. I wrote to Nelson Mandela (and received a reply!). Unfortunately, I don’t remember the exact words I wrote, but I remember feeling that this man saw beyond the exterior and was working towards a world where everyone is valued and treated equally (it’s really no wonder I became a clinical psychologist!). 14 years later, I visited his home nation for the first time. Honestly, South Africa made me uncomfortable. Don’t get me wrong, it’s utterly stunning, the National Parks and their inhabitants are spectacular, and every South African I’ve met has been great fun, incredibly welcoming and has an endless appetite for braii, but it still has a hell of a long way to come since the days of Apartheid. Make no mistake, Apartheid is still present. The divisions and inequalities between black people and white people hit me square in the face; it’s hard to miss. The racist undertones often left me speechless and confused at how such hurtful, ignorant sentiments could be uttered by otherwise such kind and educated people. I get that the racism amongst my generation of white South Africans, who were too young (or not yet born) to remember the final years of apartheid, has mostly been borne out of the government’s attempts to ‘undo’ a grisly history; for example, the white candidate now loses out on a job not because there was a better candidate but because there was a black candidate; and that older generations around the globe can often (but not always!) be a product of their time, but this doesn’t explain the stark and shocking inequality that persists in the context of a world that is surely (hopefully!) moving forward in its racial equality (and equal rights for all more generally). The difference between how the majority of black and white people live is nothing short of gut-wrenching. All across the country, black people live in shanty towns, while a mile up the road, white people live in fancy gated mansions with security cameras and guard dogs, often with black employees as gardeners and ‘maids’ (I hate this word; it’s archaic and hierarchical), who cook, clean, do laundry and look after the children. I have no problem with people taking these roles, clearly it gives them employment and an opportunity to earn a living, nor with those who choose to employ people to help around the house, but I do have a problem with the clear black-white divide. 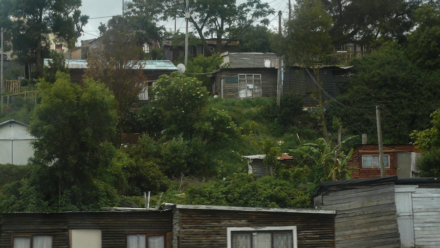 Yes, shanty towns with white residents also exist, but these are few and far between compared to the sprawling settlements of make-shift housing permanently resided in by black South Africans. Now, I think it’s important to be transparent about my own circumstances and the foundations on which my views are based. I’m white British and I come from a middle class background, and with that I certainly had a privileged upbringing. The U.K. is not perfect, and non-white people in Britain are more likely to be of a lower socio-economic status than white people, but there are two key differences as I see it: the welfare system and access to social housing doesn’t discriminate between race, religion and other markers of diversity, and fear and hate talk directed towards people of races different from your own is not accepted as normal, as it appears to be in South Africa (yes, even in the context of Brexit and the European immigration crisis, these feelings are only expressed by a tiny, and rightly shunned, minority). I have only once experienced shocking racism in the U.K. and it transpired that this person’s hideous view was based on having never met a black person (this is in rural north England, where sadly the population isn’t particularly diverse); white South Africans do not have this excuse. Throw out any pre-conceptions of a now harmonious bi-cultural post-Apartheid society. Sadly racism directed towards marginalised native populations is a common theme within countries previously invaded and colonised by Europeans; I have witnessed this first hand in the United States (can we please be clear that Native Americans are not ‘Indians’ and that if you need to collectively refer to people, using a tribe name is most respectful…but I digress! ), Canada, Australia and I am starting to pick up on in New Zealand as well, but that’s another story, and in these countries it certainly doesn’t swing in like a wrecking ball to smash all your pre-conceptions of a wonderful postcolonial country rebuilding itself after white invasion quite like it does in South Africa! I’ve witnessed a lot of poverty and discrimination, through both work and travel, and it is always sad to experience, but certainly South Africa got under my skin. I left declaring that it’s a fabulous place to visit but I couldn’t live amongst the racism.